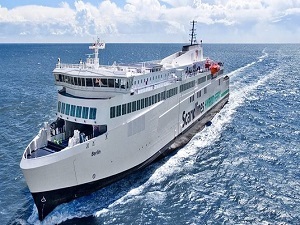 Swedish HH Ferries Group has inaugurated the two ferries Aurora and Tycho Brahe as the world’s largest battery-powered passenger ferries on the route between Helsingborg, Sweden and Helsingör, Denmark. Held on November 9, the inauguration marks a milestone for the company’s green strategy, according to HH Ferries. The project reduces the company’s total emissions of CO2, NOx and particles by 65% when the two high-frequency ferries are powered by green electricity. The battery project on Tycho Brahe and Aurora has lasted more than three years, and with a financial scope of around SEK 300 million (USD 33.1 million), it represents HH Ferries Group’s largest single investment ever. INEA, the European Union’s executive agency for innovation and network, has supported the project with around SEK 120 million. batteries within a few minutes. The batteries are located on top of the ferries along with two deckhouses for transformers, converters and cooling systems. HH Ferries operates the Helsingborg-Helsingör ferry route, transporting up to 50,000 passengers and 9,000 cars across Öresund on a daily basis. Separately, the company announced that, in an effort “to show that the journey towards becoming the most sustainable transport company in the region is serious,” it will also change its name to ForSea. “With battery-driven ferries we are taking a big step forward for less emissions, smoke and noise. And we will not compromise on efficiency,” Johan Röstin, CEO at HH Ferries Group, said.